Campbell’s willingness to point out the gender bias of male mythology extends all the way back to his first published work, the extensive commentary accompanying the Navajo myth of Where the Two Came to Their Father (1943). 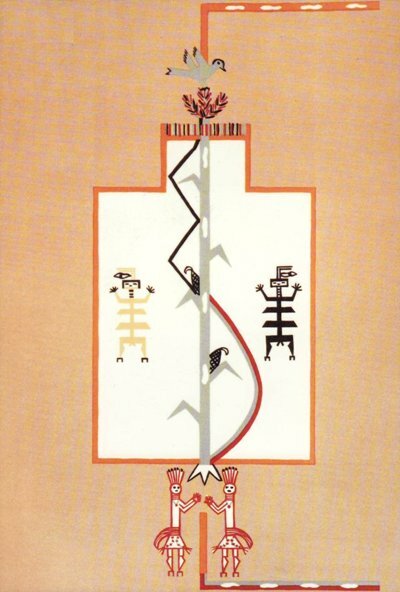 The original publication consists of a beautiful folio containing eighteen silkscreens of Navajo sand paintings, reproduced by artist Maud Oakes under the direction of Navajo “Singer” Jeff King. The two, Sun-child and Water-child, antagonistic yet cooperative, represent a single cosmic force, polarized, split, and turned against itself in mutual portions. The life-supporting sap-power, mysterious in the lunar rhythm of its tides, growing and decaying at a time, counters and tempers the solar file of the zenith, life- desiccating it its brilliance, yet by whose heat all lives. 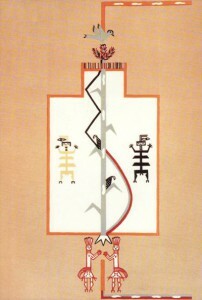 The accompanying eighty-eight-page text booklet was comprised of two Navajo legends, recorded by Oakes and King together, along with extensive commentary by the young mythologist, Joseph Campbell. This first Campbell work explores the masculine initiation myth of the Navajo twin heroes in great depth. An empathic reading of the text, accompanied by meditative study of its sand paintings, may invoke in men an archetypal experience of what it means to be male in relationship to the feminine. While Campbell’s readership tends to focus on the single male hero mythologem documented later in The Hero with a Thousand Faces (1949), Campbell presents his most complete treatment of a hero myth in the commentaries on the twin heroes mythologem accompanying Where the Two Came to Their Father (1943). As a paradigm for the development of the specifically male hero principle, the journey of the Navajo twin heroes is unrivalled in Campbell’s writing. Indeed, Campbell’s scholarship was profoundly influenced by his understanding of the solar and lunar images of the masculine principle. Western patriarchal culture has consistently interpreted solar psychology as masculine and equated lunar psychology with the feminine. Yet many problems have resulted from our culturally distorted perception of solar and lunar principles. Moreover, a culturally distorted “solar” revisioning of Campbell’s hero, a bias which Campbell himself did not share, has contributed greatly to various misreadings of Campbell’s monomythic hero’s journey.